Cary, NC – The holidays hopefully mean getting to spend more time with friends and family, which can include a social drink. Instead of your typical glass of wine or bottle of beer, try mixing things up this year with our ideas for holiday cocktails. Yes, we know Thanksgiving has already passed but pumpkin flavors are still popular this time of year. Also, you can drink any of these delicious cocktails at any time of year; don’t feel trapped by the calendar. You are your own master. “Pumpkin spice” is often treated as a punchline but it’s a strong, cinnamon-like flavor that fits the cold temperatures well. Pairing that with an equally strong liquor like bourbon can result in a good pairing. You can find “pumpkin spice syrup” at the store or you can make it yourself, boil a cup of water and sugar together with half a tablespoon of pumpkin spice (you can find this with baking ingredients to make pumpkin pie) and eight ounces of pumpkin puree. Make sure you stir this until it is one boiling, smooth mixture, then strain it. Wait for it to cool down before serving; in fact, best to save it and chill it for a day or so before you make cocktails for your guests. With ice, shake one ounce of your syrup with two ounces of bourbon, four ounces of seltzer and a quarter ounce of fresh lemon juice. Serve over ice, and for extra flavor, rim your glass with cinnamon, allspice, ground ginger and brown sugar. You can also serve the drink with a lemon wedge. Last year, we suggested a peppermint cocktail recipe for Christmas. This year, instead of mint, we have an idea for a chocolatey drink that fits the season. To balance the chocolate flavor out, find a vanilla flavored vodka and stir two ounces of that, together with two ounces of white chocolate liqueur, one ounce of crème de cacao and one ounce of half-and-half. The half-and-half will help the chocolate from being too overpowering and also let the vanilla and chocolate flavors blend. Stir these in a glass with ice, being careful not to let the stirring spoon hit the ice and chip off pieces, and then strain into glasses. For added flavor, coat the rims of your glasses in honey and coarse sugar. This will also give your drink even more of an icy, snowy appearance. 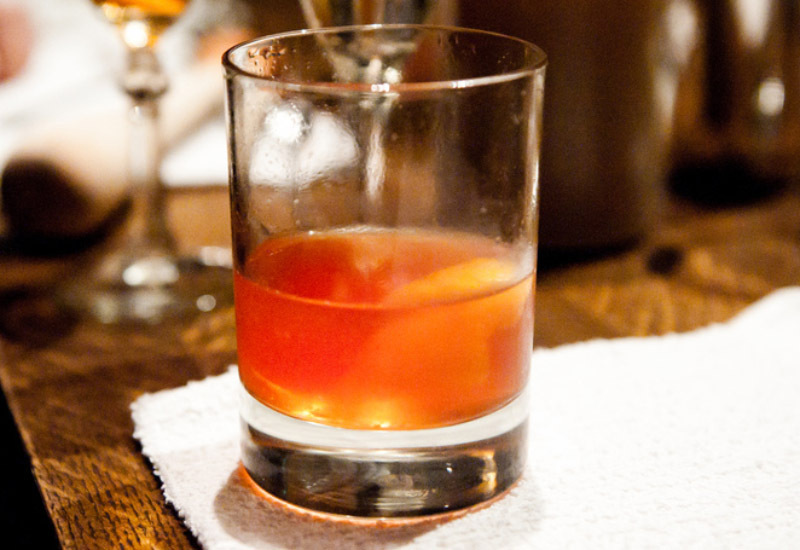 An Old Fashioned is a perennially popular cocktail; probably why it has that name. But you can make your Old Fashioned taste like the weather outside by infusing some cranberry flavors. You will keep most of the common Old Fashioned recipe: use three ounces of bourbon and three dabs of Angostura bitters. But you will also add an ounce of syrup made with cranberries. The syrup is easy enough to make. Boil water, with a ratio of two cups for every cup of water and cup of fresh cranberries you use. Stir the whole time and once it all comes to a boil, wait five minutes before taking off heat and straining. Like the pumpkin spice syrup, wait for this to cool before using it in your drinks. Stir your ingredients together in ice and serve, using either typical Old Fashioned garnishes or make it more festive with cranberries and rosemary. To see more drinks and recipes, go to FoodCary.com. Story by staff reports. Photos by David Silverman, PersonalCreations.com and John Joh.